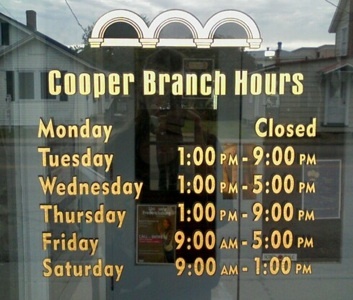 The Cooper Branch is closed until further notice due to building maintenance. During this time, a satellite branch at Colonial Beach Baptist Church will be open starting Monday, October 15 to offer limited library services. Services available: WiFi, computers, printing, holds pick up and a selection of popular materials for check out. 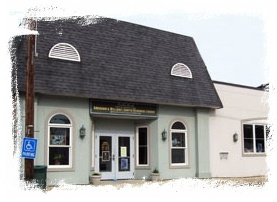 Colonial Beach 's library is a 4,700 square foot facility with over 24,000 items formally known as the Abraham and William Cooper Memorial Branch. Designed by The Lukmire Partnership of Arlington, Virginia, it was funded by a donation from the Douglas Cooper Family and by FOTL fundraising activities. Starting out in 1972 in a church basement, it moved to a location on Hawthorn Street five years later and in 2000, it moved to it's present location on Washington Avenue. The facility sometimes doubles as a driver improvement course test site, thanks to the availability of a classroom onsite. It also offers things like computer classes, kids, teen and adult movie nights, children's storytime, afternoon tea and game nights. Check their events calendar for dates and times. There's plenty of free parking, as well as transit service, so come on down!